First talk to students about cranes and birds in general. We are near the beach so we discussed how pelicans fly in V formation all going the same way etc. This is so they think about how to lay out their bird pattern. Then I have them trace 8 cranes (in the end they will have 10 total because they glue the two they use to trace). Next have students trace the moon on their large watercolor paper with gold chalk pastel. Set aside or collect so they don’t get it dirty and play with it. Then use dark brown chalk pastel to trace the crane pattern. Next use fingers to blend cranes. I show students how to hard blend with one movement around crane so they won’t blend it away. And then soft blend the other parts. Next use chalk pastel to blend pattern and wind into background (white and gold for lighter areas and brown and black for darker ones) Finally paint the moon using white tempera with a dot of yellow. 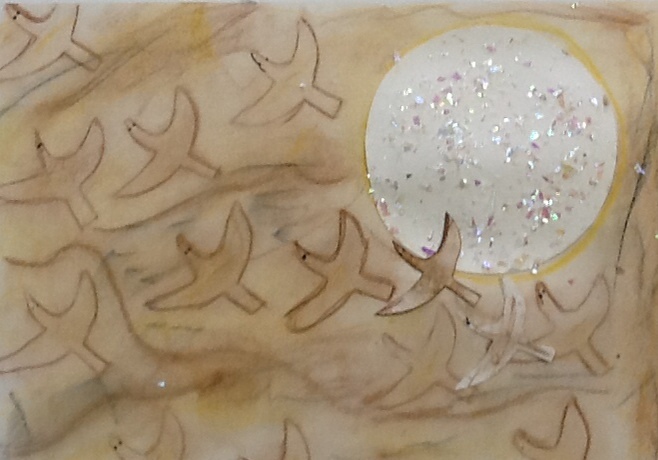 While moon is wet have students sprinkle with sparkles and adhere with glue the two cranes and moon. Sign names and you are finished!